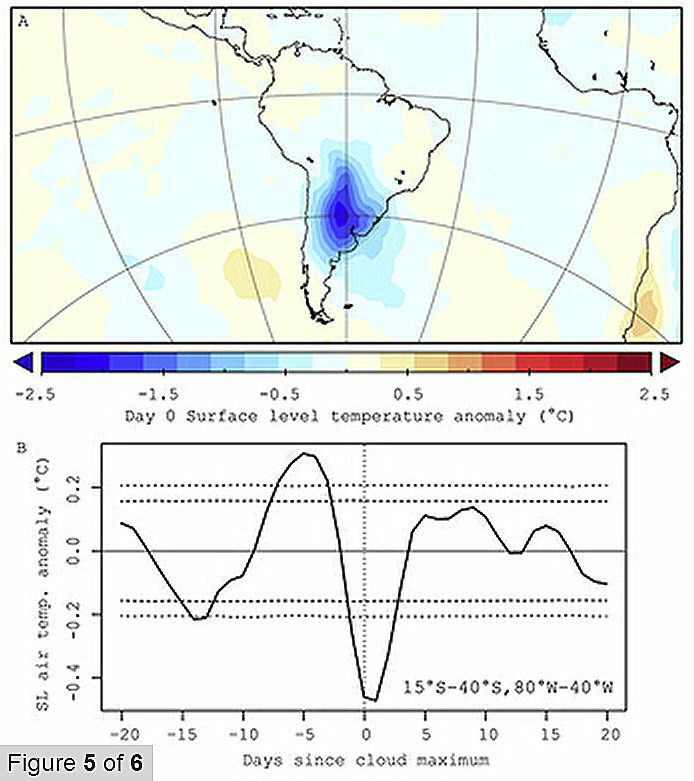 A paper published today in the Journal of Geophysical Research finds that a natural atmospheric oscillation, the Southern Annular Mode, is correlated to significant increases in cloud cover resulting in "large scale" local cooling of approximately -2.5C. All climate models falsely assume clouds result in net positive feedback and increased temperatures, however this new paper and several others show clouds instead result in net negative feedback and cooling. This work investigates the cause and effects of extreme changes in synoptic-scale cloud cover operating at daily timescales using a variety of satellite-based and reanalysis data sets. It is found that the largest sudden increases detected in globally averaged cloud cover over the last ten years of satellite-based observations occur following positively correlated shifts in the phase of the Southern Annular Mode (SAM) index. The associated pressure anomalies are found to generate frontal cloud formation over large areas of the South American continent, increasing regional cloud cover by up to 20%; these changes are correlated to statistically significant reductions in local temperatures of approximately −2.5°C with a +1 day time lag, indicating the SAM index is associated with large scale weather fluctuations over South America. The average cumulus cloud weighs 800 tons, adding a considerable amount of mass between the Sun and the Earth's surface. These visible water droplets are being constantly heated and evaporated by the Sun's energy during the day. Water droplets are being constantly "boiled" off of the surface of the cloud. This newly generated water vapor then rises to altitude of lower temperature and pressure where it releases energy and recondenses. This is energy that never made it to the Earth's surface during the daytime. At night, this same absorption, rise and release of energy SLOWS the cooling of the Earth. AT NO TIME DO CLOUDS OR WATER VAPOR WARM THE EARTH. The ridiculous Kiehl-Trenberth "Radiative Budget" shows 168 watts per square meter from the Sun and 324 watts per square meter from water vapor and the "other" magic GHGs including trace amounts of Carbon Dioxide and Methane. As a student pilot who accidently flew a Cessna 150 thru the 200 mph up and down drafts [vertical shear] of a cululus cloud i can state...."you have NO idea the energy transfer within a cloud until you have been thru a cloud". HOW HAS SCIENCE BEEN HIJACKED BY THIS GHG NONSENSE FOR TWENTY YEARS ? and/or evaporate it away. Effects from this condition can be felt almost instantly. This cloud bank effect has, on many occasions, warmed the air enough to awaken me from a sound sleep(I sleep with windows open, no AC). worth his salt knows this. I'm learning physics as I go along, and would have thought the amount of heat the same clouds block from the sun during the day would be many times more than the little leaving the surface at night. Compare the temperature in the sun and the shade, it's about 10C from memory, nothing like that at night so a pretty simple equation they don't need to spend millions on to discover, that's probably around A level maximum.